Named for the habitat it prefers—the boreal forests of Canada and the extreme northern United States. Other names: Arctic saw-whet owl, Richardson’s owl, sparrow owl, Tengmalm’s owl (in Europe). Eskimos called it “the blind one” because it allowed people to walk right up and touch it during daylight. Hunting habits: Eats mostly mice and insects, along with a few small birds. Normally hunts only at night unless facing starvation. Migrating habits: An irruptive migrant—the numbers fluctuate a great deal from year to year. Periodic crashes in food supply lead to late fall and winter invasions. Individuals become more visible because hunger forces them to hunt in the daytime. Nesting habits: Nests in a tree cavity, especially an abandoned pileated woodpecker hole, or in a wood duck house. Normally lays 4-6 pure white eggs. Female incubates the eggs for 27-28 days, and the young first fly 28-33 days after hatching. 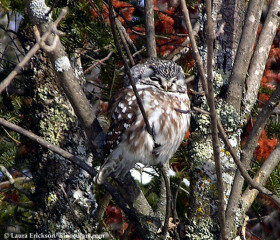 Life expectancy: One banded Boreal Owl from Germany lived 15 years, 11 months.